The Bahá’í Faith is the youngest of the world’s independent monotheistic religions. Founded in Iran in 1844, it now has more than five million adherents in 236 countries and territories. Bahá’ís come from nearly every national, ethnic and religious background, making the Bahá’í Faith the second-most-widespread religion in the world. Bahá’ís view the world’s major religions as a part of a single, progressive process through which God reveals His will to humanity. Bahá’u’lláh (1817-1892), the Founder of the Bahá’í Faith, is recognized as the most recent in a line of Divine Messengers that includes Abraham, Moses, Buddha, Zoroaster, Christ and Muhammad. For more information on the history of the Bahá’í Faith visit the website of the Bahá’í’s of the United States. Bahá’ís continue to suffer severe government-sponsored persecution in Iran, where the Faith originated in the mid-19th century. Read more concerning the history human rights in Iran or stay abreast of current news and events at iran.bahai.us. The persecution of the Baha’i Faith, a religious minority in Iran, is a concern of individuals and governments worldwide that are conscious of the need for justice and the upholding of global human rights. US House Resolution 134 addresses this very issue. Condemns the government of Iran for its state-sponsored persecution of its Baha’i minority and its continued violation of the International Covenants on Human Rights. Calls on the government of Iran to release seven specified imprisoned Baha’i leaders and all other prisoners held on account of their religion, including: Mrs. Fariba Kamalabadi, Mr. Jamaloddin Khanjani, Mr. Afif Naeimi, Mr. Saeid Rezaie, Mr. Behrouz Tavakkoli, Mrs. Mahvash Sabet, Mr. Vahid Tizfahm, Ms. Raha Sabet, and Mr. Navid Khanjani. Calls on the President and Secretary of State, in cooperation with the international community, to condemn Iran’s continued violation of human rights and demand the release of prisoners held on account of their religion, including the above-named individuals. Urges the President and Secretary to utilize all available measures, such as those available under the Comprehensive Iran Sanctions, Accountability, and Divestment Act of 2010 and Executive Order 13553, to sanction Iranian government officials and other individuals directly responsible for human rights violations in Iran, including against the Baha’i community. Congressman Mo Brooks, representative for the fifth district of Alabama, has given his support as well to this key piece of legislation. 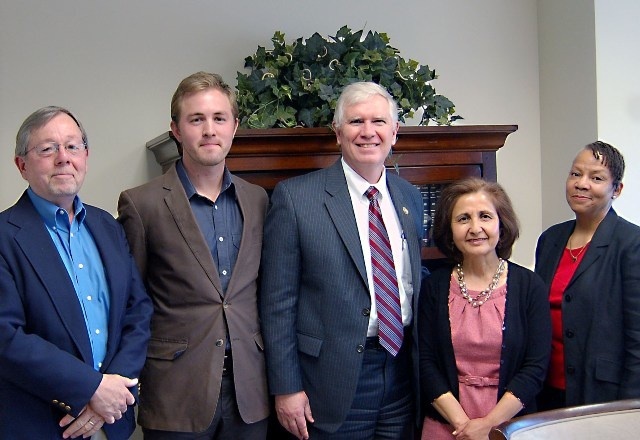 On 18 March 2011, a delegation of local Baha'is met with Congressman Brooks to discuss human rights in Iran. Shortly after, the Congressman gave his support to House Resolution 134 which addresses the situation of religious freedom in that country.